The (other) main characters, viewed from the human perspective, are Ren and Sonny, two twelve-year-old boys living next door to each other in the Richmond area of Melbourne, near the Yarra River around the 1960s to ’70s. Sony is a bit like the uprooted trees that occasionally career down the river, a potential hazard. Ren becomes his best friend and tries to buffer Sonny’s behaviour. Ghost River is an ode to the river and the people who love and understand it, which includes a group of old, ‘homeless’ men who live on the riverbank in a makeshift camp. The boys befriend the ‘river men’ and show compassion for them and their situation. The local low-life also features, in the form of criminals and a corrupt policeman. From the boys’ point of view, the work crew that blasts the riverbank in preparation for the building of a new road, is an enemy of the river and needs to be stopped. Old buildings and derelict cars near the river give the boys shelter and hiding places. The river seems to take what it needs, apparently exacts revenge against those who wrong it and takes into its bosom those who prefer it to society. It gives the boys days of pleasure and adventure as they swim and explore. The places in this story are real and keenly observed. One gets the feeling that Tony Birch is partly describing his own childhood in the area and his own mixed ethnic background. His love of the inner city and of the river is palpable, as is his respect for people who are faced with challenges, whether of their own making or not. 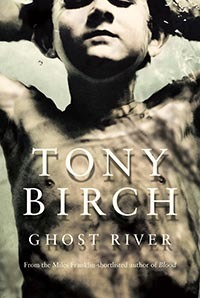 While the ‘ghost river’ has a defined meaning in this book, the river winds through the story like an ever-present ghost.